Sophomore guard Jair Bolden dribbles the ball during a men's basketball game against Princeton Wednesday. Men’s basketball shot a lower percentage from the field and scored fewer points in the paint than Princeton Wednesday night, but the Colonials still came away with the victory. GW’s winning effort came behind a 37-23 rebounding advantage, including 18 offensive glass, that allowed the Colonials to get 17 second-chance points and control the momentum at the Smith Center. GW (5-4) defeated the Tigers (2-6) 71–60 at the Smith Center to move above .500 for the first time in more than two weeks. 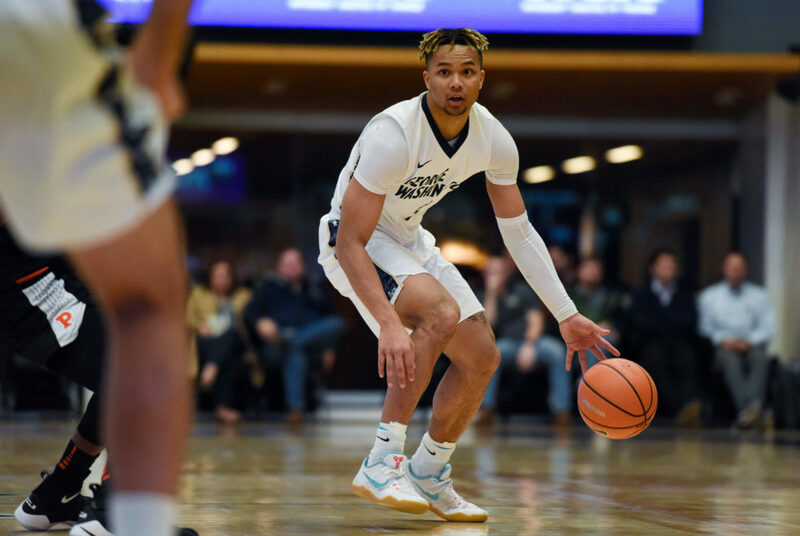 The win was the third consecutive victory for GW and moved the Colonials’ all-time record against Princeton to 3-2 – a series that dates back to 1925. Bolden led GW in scoring with a career-high 25 points on 8-of-15 shooting. He turned the ball over only once on the game. The Colonials, who did not see much success on the exterior – shooting 27.8 percent from the three-point range – funneled the ball into the paint at key points of the game. GW’s three forwards, graduate students Patrick Steeves and Bo Zeigler and sophomore Arnaldo Toro, combined for 25 points, 15 rebounds and all shot 50 percent or better. The Tigers relied heavily on junior guard Devin Cannady to control their offense and keep GW’s defense on their toes. He scored a team-high 23 points on 9-for-14 shooting and three made baskets from beyond the arc. Sophomore forward Arnaldo Toro shoots over a Princeton defender during a men’s basketball game Wednesday. A three-ball from senior guard Yuta Watanabe started the game off strong for the Colonials, but they struggled to continue to find the basket at the beginning of the game. GW missed all of its next 10 shots and the Tigers took a 9–3 lead in the opening four minutes. Three baskets from Bolden and a shot from Toro tied the game at 13 about five minutes later. Bolden continued his hot shooting, hitting a three-pointer and a pull-up jumper that gave GW its first lead since the opening minute at 18–16 with seven minutes to go in the half. Princeton free throws tied the game up, but the Colonials responded with a 7-2 run capped off by another jumper from Bolden – forcing the Tigers to call a timeout. GW maintained a two-possession lead for the rest of the half until a buzzer-beating three from Cannady brought the halftime score to 31–28. The second half began with the Tigers tying the game up with a shot from beyond the arc. They took a one-point lead less than two minutes later after another three found its mark. Consistent shooting from Bolden on the perimeter and Toro and Zeigler on the inside regained the Colonials lead, but Princeton was trading baskets. Watanabe’s second three-pointer of the game and a second-chance basket from sophomore guard Justin Williams gave GW its largest lead at that point in the game – 49–41 – with 12 minutes to go. 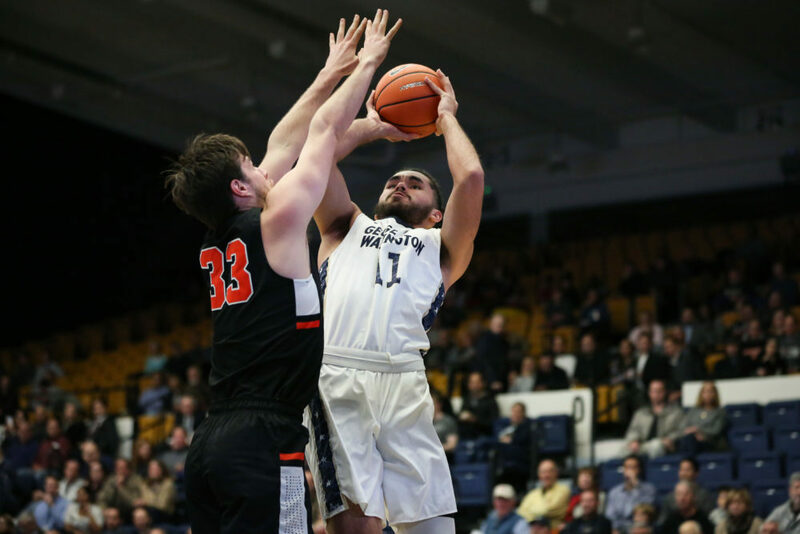 Princeton continued to make shots and maintain its high field goal percentage, but GW did not trail once in the final 16 minutes of the contest. The Colonials continued to score despite an active Tigers defense and they trailed by as many as 13 points with 2:35 in the game. The last couple minutes were slowed down by Princeton fouls that ended up being inconsequential in GW’s double-digit victory. The Colonials return to action Saturday on the road against Penn State when they take on the Nittany Lions at 4 p.m.